The delay handed the Japanese a golden opportunity to set their house in order before Allied war crimes investigators arrived. After 14 August groups of Allied POWs were brutally murdered. Vast amounts of documentation concerning crimes were burned ahead of the arrival of Allied forces. POW facilities and medical experimentation installations were either abandoned or destroyed. Perhaps the greatest crimes were continuing deaths of Allied POWs from starvation, disease and ill-treatment after the Japanese surrender. 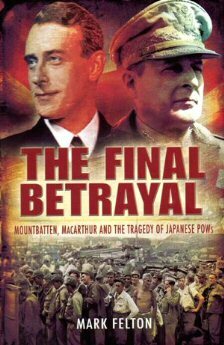 The blame rests with the American authorities, and particularly General MacArthur, Supreme Allied Commander in the Pacific. MacArthur expressly forbade any Allied forces from liberating Japanese occupied territories before he had personally taken the formal Japanese surrender aboard the USS Missouri in Tokyo Bay on 2 September 1945. Vice Admiral Lord Mountbatten, Commanding Allied forces in Southeast Asia, protested against this policy, believing that pandering to MacArthur’s vanity and ego would mean condemning many starving and sick prisoners to death. Deaths among British and Commonwealth POWs were significant as opposed to American POWs who were already largely liberated in the Philippines and elsewhere.